On 1 December 2015 the European Parliament Ceramics Forum (EPCF) met for its 16th Plenary meeting in Brussels. Trade, particularly the thorny issue of whether or not to grant China Market Economy Status, and climate, namely the carbon leakage protection in the reviewed EU Emissions Trading Scheme post 2020, featured on the agenda. The event was co-hosted by EPCF Chairs MEP Paul Rübig and MEP Inmaculada Rodríguez-Piñero, and attracted over 120 participants from EU institutions, the ceramic industry and other stakeholders. Setting the scene for the event, Vice-President of the European Parliament MEP Antonio Tajani highlighted the ceramic industry’s significant contribution to the target of 20% share of GDP for European industry by 2020. He maintained that a strong industrial policy and a level playing field are crucial for EU to compete at global level. The first panel, EU Trade Defence Instruments and the non-Market Economy Status (MES) of China, was moderated by MEP Jude-Kirton Darling. Panellists included MEP Rodríguez-Piñero, DG Trade Director Leopoldo Rubinacci, AEGIS Europe spokesperson Ines Van Lierde (presentation) and Cerame-Unie President Alain Delcourt (presentation). The topic, currently under discussion in the European institutions, could have severe economic consequences for many EU manufacturing sectors including the ceramic industry. The question of whether or not to grant MES to China originally evolved out of a subparagraph of China’s WTO Accession Protocol expiring in late 2016. The current debate, however, acknowledges that granting MES is not necessarily automatic and all agree that China does not meet EU criteria to be considered a market economy. While some argue that it is a political decision, the industry urges policymakers not to ignore the economic reality, namely that removing anti-dumping measures would put at least 100,000 direct EU ceramic jobs at risk. Moreover, a recent independent study found that up to 3.5 million EU jobs could be at risk if China were granted MES prematurely. For European industry to maintain and create EU jobs a level playing field is absolutely critical. Consequently, before making any proposal, EU policymakers should conduct a full impact assessment, coordinate with major trading partners and ensure the continued efficiency of the EU’s trade defence instruments, in particular for SMEs. The second panel, Post-2020 EU Emissions Trading Scheme (ETS) in the context of COP21 moderated by MEP Rübig, looked at the EU ETS review proposed by the European Commission in July. The panel brought together DG CLIMA Head of Unit Hans Bergman, EPP shadow rapporteur on EU ETS review MEP Ivo Belet, Luxembourgish Environment Attaché Christophe Hansen, MEP José Inácio Faria and Wienerberger CEO Heimo Scheuch. The ceramic industry is a key player in the debate on EU ETS with the most installations but less than 1% of the emissions. Speakers agreed that EU ETS legislation post 2020 should include protection measures for sectors at risk of carbon leakage. Although not in the European Commission proposal, the panel addressed the request from some Member States to consider differentiation between sectors in carbon leakage protection levels. The ceramic industry is convinced that this is not the right way forward as it may lead to an unequal level playing field even on the EU internal market. As a highly innovative and efficient sector, the industry actively contributes to the achievement of the EU’s climate targets. But for long-term investment it is essential that the ceramic industry receives fullcarbon leakage protection after 2020. Regarding the ongoing climate negotiations in Paris, panellists expressed their hope that COP21 will result in a strong and legally binding global agreement. 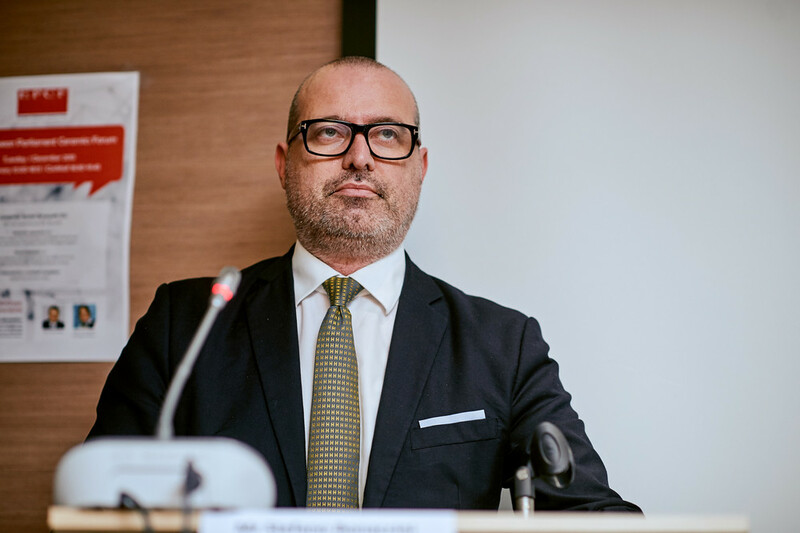 A keynote speech from Stefano Bonaccini, President of the Emilia Romagna Region in Italy, rounded out the presentations. He explored the role that ceramics play in his region, as a sustainable industry with social and economic relevance. The 16th EPCF Plenary was concluded by thanking MEP Rübig for his commitment as EPCF Chair since 2014 and welcoming the new EPCF Chair and first Chairwoman, MEP Rodríguez-Piñero. Thanks to all speakers and participants for making this year’s event a success and we look forward to celebrating the 17th Plenary meeting on Tuesday, 29 November 2016. The Plenary meeting takes place in the context of the 2015 Ceramic Days organised by Cerame-Unie, the European ceramic industry association. As the preeminent policy event for Europe’s ceramic manufacturers, the Ceramic Days present a key occasion for representatives from all ceramic sectors, experts and policymakers to exchange ideas at sectoral and public events.